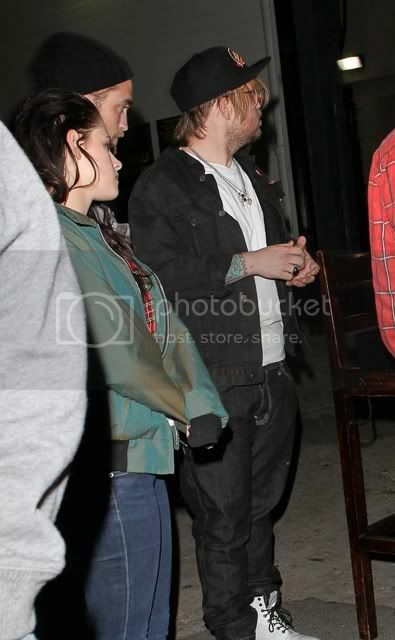 CelebGossip Rob and Kristen leaving Marcus Foster's concert last night . Pictured with R/K their friends/Marcus' bandmates. Can't vouch for this report but here goes...Celebuzz Update Robert Pattinson and Kristen Stewart were photographed Saturday heading to watch good friend Marcus Foster perform at The Hotel Cafe, and a concertgoer is giving Celebuzz a few more details on our favorite couple’s night out. As for their PDA level? "I saw them quickly sneak a few kisses. Kristen was kind of in front of Rob, singing along at times. It was cute how he was looking on at her! They also held hands when they went to the backstage part." So glad they had a fun night out! We’re also told after they left they grabbed some drinks with their group elsewhere before heading home together at the end of the night.